Need a break from the heat or the beach? Then the place to go is the 3D Museum of Wonders in Playa del Carmen. Considered the first 3D illusion art museum in the Americas, its exhibits are unique and interactive. Open daily, the museum provides family-friendly entertainment on any day, including rainy ones. Your admission gives you access to all rooms. Feel free to bring your camera and take photos of your favorite exhibits — it’s not your everyday museum. 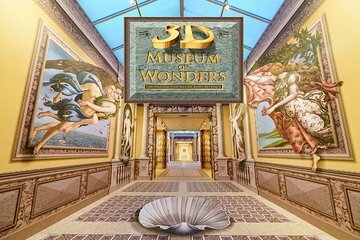 Top off your stay in Playa del Carmen with a visit to the centrally located 3D Museum of Wonders. It’s open everyday, so no matter the weather, you can find entertainment here for the whole family. All of the work inside the air-conditioned museum is located on one floor. Touch screens and explore the interactive exhibits. If you want to snap shots of you with some of these hard-to-believe 3D images in the background, no problem. This is not your conventional museum with restrictions on taking photos. Most people spend 90 to 120 minutes going through the museum, but stay as long as you like — your ticket gives you access all day during operating hours. It exceeded my expectations! This is a 10 destination. Our tour guide was Ieva, and without her, my pictures would be just 'normal' pictures, but instead they were PROFESSIONAL, and my pictures came to life!! I have nothing but good things to say about this 3D Museum and all of the wonderful time we had. This museum is a great to place to take a brake from the hot beaches and a place for the family to have fun. Thank you Ieva, for making our visit a pleasant one! Amazing experience. We went right after opening time and no one was there but us. The whole place was empty therefore we could make incredible pictures without queuing or with others in them. Very friendly staff.